Choosing a Wiccan name can be a pretty exciting part of taking on a new spiritual path, but you should know a bit more about it before making any final decisions. First of all, why are you choosing a Wiccan name at all? Just because you feel you have to, or is it because it feels like the cool thing to do? Needless to say, these are not the right reasons for taking this step. This isn't supposed to be some whimsical notion that comes and goes as your mood changes. A new name for yourself should be a relatively serious commitment to a new way of life. In the past, people took second names as a way of protecting themselves from a very intolerant world but also as a way of separating his or her spiritual life from everyday things. If you feel that there is a serious reason why you need a second name, then go ahead. Just don't do it for fun. So how do you choose a Wiccan name? Well, that isn't really a simple question. This is going to vary for everyone. The somewhat typical route is to create a unique name that holds some sort of personal meaning, often containing qualities that you find in yourself. It's pretty common to take a mythological or fantasy-oriented approach but that is certainly not a requirement. Something like Selena Warrior-Wolf or Athena Firestorm would be two examples. Feel free to use them if you wish. Animals, elements, herbs, Deities and just about anything else could be used to create that perfect identity for yourself. I personally kept it simple. I am a solitary practitioner so I never needed a name for public or coven use, but I did want one for online use. I picked "Pythia", which was the name of the priestesses who managed the ancient Oracle of Delphi. It was different and it held a mysterious element that I liked. So when you're trying to choose a Wiccan name, take your time until you find something you like. It can be complicated or simple, and can embody just about anything. Will it represent who you are, or who you want to be? That's up to you. 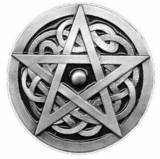 Leave the Choosing a Wiccan Name page, and go back to the Wiccan religion page.